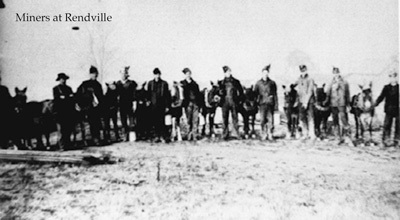 Miners at Rendville. Courtesy of the Little Cities of Black Diamonds Organization. The "Corning War" illustrates the racial tensions that existed in southeastern Ohio during the late nineteenth century. In 1879, the Ohio Central Coal Company established Rendville, Ohio, which is located in Perry County. Traditionally, white miners had refused to allow companies to hire African-American miners. William P. Rend, the founder of Rendville and owner of a mine in this community, hired large numbers of African Americans as well as Europeans. White miners in surrounding communities, especially in Corning, Ohio, feared that African-American miners would drive down wages. To prevent the continued use of African-American miners, in 1880, white miners in Corning and neighboring communities descended upon Rendville, apparently hoping to drive the blacks from the community. In an attempt to mask their true intentions, the white miners smuggled firearms into the community in wagons, with the guns concealed under hay. According to newspaper accounts, no significant violence occurred, although Ohio Governor Charles Foster did dispatch the Ohio National Guard to disburse the mob. In a small skirmish, three or four protestors were injured. This event became known as the "Corning War." Tensions between the white and black miners continued. In 1888, a mob of Corning whites prepared to descend on Rendville, following the murder of a white Corning man presumably by an African-American man from Rendville. Rendville's mayor, Isaiah Tuppins, convinced Corning law enforcement officials to disperse the mob and to protect the accused man.